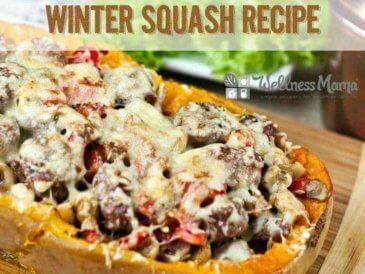 Winter squash is a wonderfully versatile food that is easy to grow, easy to store and easy to cook. The whole squash can be used, including the seeds, and often winter squashes are available at great prices, making them an amazing budget friendly food. 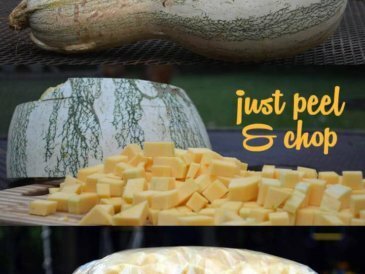 In the Fall, I’ll often plan our family’s meals for the week around a large winter squash since one large squash (like a cushaw) since it can be a side dish on its own, a base for soups, pureed in smoothies and even the seeds can be roasted for a snack! Cushaw squash are my personal favorite winter squash because of their large size (about 20 pounds) and inexpensive price (I get them locally for about $4.00 at a local farm). They can be hard to find in regular stores, but check with local farmers and gardeners to find them where you live. 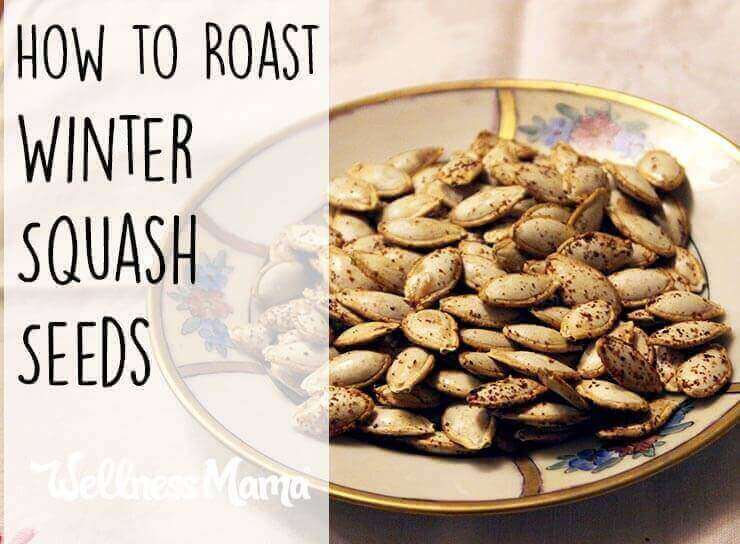 If you do succeed in finding a good local Cushaw squash, save some of the seeds before you roast the rest! 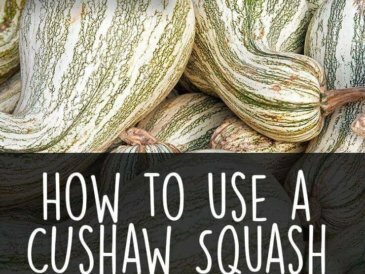 Cushaw are easy to grow but difficult to find seeds for, so save them if you find them! To save: pull out the desired number of seeds and let dry in open air on a clean cloth. When fully dry, store in an envelope for planting the next year. If you have a few feet of extra space in your backyard that gets a little sun, you can easily grow a cushaw patch and let your children help! These squash are a great substitute for pumpkin or any other winter squash and your children will have a blast growing them. Like all winter squash, they store easily in a cool place in your home or they can be chopped, sliced, or pureed to freeze for later use. Winter squash seeds are a good source of magnesium, copper, manganese, potassium and other nutrients. 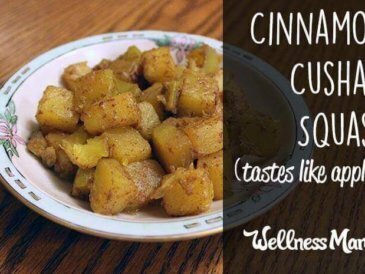 Though they often get thrown away when preparing a recipe, they are a wonderful nutrient-packed snack and you can make them sweet (add honey and cinnamon) or savory (add salt herbs). One cup of roasted squash seeds has about 12 grams of protein (give or take, depending on the variety). If you have kids, let them help you make this simple recipe and enjoy it as a family! 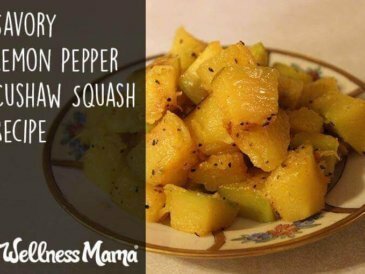 A great way to use the seeds of any winter squash: cushaw, acorn, pumpkin, etc. Add the 1 teaspoon salt and seeds and simmer for 10 minute. This process makes them more easily digestible. Remove seeds from water and dry. Sprinkle with salt, garlic powder, and paprika. Bake in preheated oven for 30 minutes, stirring every 10 minutes. You could substitute any combination of seasonings here. Be adventurous! 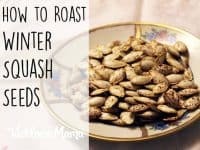 Ever roasted squash seeds? How did they turn out? Share below!